The ALPHA experiment at CERN, led by Swansea University scientists, has carried out the most precise and accurate measurement ever done on antimatter. The ALPHA collaboration team of scientists has reported the most precise direct measurement of antimatter ever made, revealing the spectral structure of the antihydrogen atom in unprecedented detail. The result, recently published in Nature, is the culmination of three decades of research and development at CERN, and opens a completely new era of high-precision tests between matter and antimatter. The humble hydrogen atom, comprising a single electron orbiting a single proton, is a giant in fundamental physics, underpinning the modern atomic picture. Its spectrum is characterised by well-known spectral lines at certain wavelengths, corresponding to the emission of photons of a certain frequency or colour when electrons jump between different orbits. Measurements of the hydrogen spectrum agree with theoretical predictions at the level of a few parts in a quadrillion (1015) — a stunning achievement which antimatter researchers have long sought to match for antihydrogen. Comparing such measurements with those of antihydrogen atoms, which comprise an antiproton orbited by a positron, tests a fundamental symmetry called charge-parity-time (CPT) invariance. Finding any slight difference between the two would rock the foundation of the Standard Model of particle physics and perhaps shed light on why the universe is made up almost entirely of matter, even though equal amounts of antimatter should have been created in the Big Bang. Until now, however, it has been all but impossible to produce and trap sufficient numbers of delicate antihydrogen atoms, and to acquire the necessary optical interrogation technology, to make serious antihydrogen spectroscopy possible. 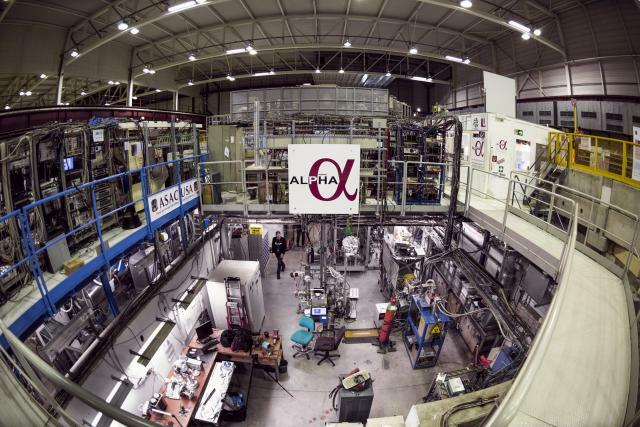 The ALPHA team makes antihydrogen atoms by taking antiprotons from CERN's Antiproton Decelerator (AD) and binding them with positrons from a sodium-22 source. Next it confines the resulting antihydrogen atoms in a magnetic trap, which prevents them from coming into contact with matter and annihilating. Laser light is then shone onto the trapped antihydrogen atoms, their response measured and finally compared with that of hydrogen. In 2016, the ALPHA team used this approach to measure the frequency of the electronic transition between the lowest-energy state and the first excited state (the so-called 1S to 2S transition) of antihydrogen with a precision of a couple of parts in ten billion, finding good agreement with the equivalent transition in hydrogen. The measurement involved using two laser frequencies — one matching the frequency of the 1S-2S transition in hydrogen and another "detuned" from it — and counting the number of atoms that dropped out of the trap as a result of interactions between the laser and the trapped atoms. The latest result from ALPHA takes antihydrogen spectroscopy to the next level, using not just one but several detuned laser frequencies, with slightly lower and higher frequencies than the 1S-2S transition frequency in hydrogen. This allowed the team to measure the spectral shape, or spread in colours, of the 1S-2S antihydrogen transition and get a more precise measurement of its central frequency. The shape matches that expected for hydrogen extremely well, and ALPHA was able to determine the 1S-2S antihydrogen transition frequency to a precision of two parts in a trillion–a factor of 100 better than the 2016 measurement. "The precision achieved in the latest study is the ultimate accomplishment for us," explains Niels Madsen, deputy spokesperson for the ALPHA experiment and professor at Swansea University. "We have been trying to achieve this precision for 30 years and have finally done it." Although the precision still falls short of that for ordinary hydrogen, the rapid progress made by ALPHA suggests hydrogen-like precision in antihydrogen — and thus unprecedented tests of CPT symmetry — are now within reach. "This is real laser spectroscopy with antimatter, and the matter community will take notice," adds Swansea University Professor, Michael Charlton: "We are realizing the whole promise of CERN's AD facility; it's a paradigm change." "This is a dream come true. Now we have our sight firmly set on improving the precision further to match experiments with ordinary hydrogen. This will be a formidable challenge but with the fantastic team we currently have I'm confident we will make progress" commented Professor Stefan Eriksson, Swansea University. The laser team includes Dr Steven Jones, whose efforts were instrumental to the collaboration's success. Dr Jones recently completed his PhD on antihydrogen spectroscopy at Swansea University. Ana Lopes from CERN provided significant parts of this synopsis of the research findings. It is also ranked within the top 300 best universities in the world in the Times Higher Education World University rankings.